Keywords: commercial cost reduction programs, integrated product teams, military, team performance, program success, integrated product and process development. Blanchard, B. S., & Fabrycky, W. J. (2011). Systems engineering and analysis (5th ed.). Upper Saddle River, NJ: Pearson Prentice Hall. Zikmund, W. G., Babin, B. J., Carr, J. C., & Griffin, M. (2013). Business research methods (9th ed.). Mason, OH: South-Western Cengage Learning. ISNAD Smith, Robert , Hammoud, Mohamad . "Does Military Integrated Product Team Performance Predict Commercial Cost Reduction Program Success?". 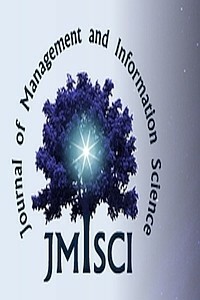 Journal of Management and Information Science 4 / 2 (April 2016): 51-60.